As usual, I’ve fallen behind on my blogging. My excuse is that it’s Bachelorette season, which means I’m covering the carnage for Previously.TV, plus I’m revising my mystery novel (more on that later, hopefully! ), so things are relatively busy. But, in the last few weeks that I haven’t touched my blog, I’ve read a bunch of books, and want to talk about some of them. So, without further ado, here are six quick book reviews. 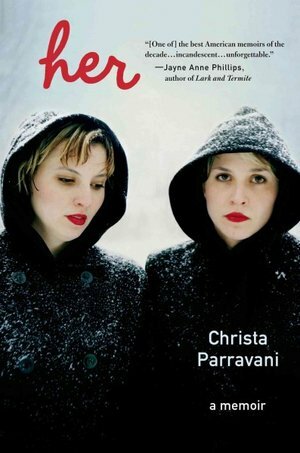 Her: A Memoir, by Christa Parravani: A devastating and beautiful memoir written by a woman who lost her identical twin sister to a heroin overdose. Parravani is a photographer who often featured her sister, Cara, in her work. Throughout their adult lives, Christa and Cara Parravani, both artists, struggled with addiction and maintaining healthy relationships, but after being violently raped, Cara’s drug use spiraled out of control. As Cara fell deeper and deeper into self-destruction, her relationship with Christa became increasingly strained. Over and over, Christa would attempt to help Cara and then become frustrated with Cara’s refusal to try to help herself. The cycle repeated itself until Cara’s untimely death. The book explores the tension between loving a person more than anyone else in the world while also resenting (and at times even hating) that person. As Christa writes in one passage about Cara’s struggles, “Not only did she not want to suffer alone, she demanded co-suffering from all who dared love her.” I teared up reading this book. Some of it was difficult to read. But I’m so glad I read it. (Here’s an NPR interview with Parravani). Harbor, by John Ajvide Lindqvist: I love a dark, Nordic thriller, and so I picked up Harbor, the story of a mysterious Swedish island whose inhabitants have struck a bargain with a sinister force. The author, John Ajvide Lindqvist, also wrote Let the Right One In, so I figured his creepy pedigree was strong. The book starts off with a family — two parents and a young girl — skiing from their cottage on the small island where they live to a lighthouse in the middle of a frozen channel. Within a few minutes of reaching the lighthouse, the little girl has disappeared. There are no other people around, no trace of a body, no hole in the ice. The girl appears to have been swallowed up into thin air. The book follows the girl’s desperate father as he searches over the coming years for his missing daughter and unravels the island’s dark secrets in the process. Harbor is not so much a thriller as a supernatural horror story: think a Stephen King novel set in small town Sweden instead of small town Maine. It’s weird, and creepy, but it can be a bit ponderous, at times. Overall, though, it was an engaging read, and something different from your standard Dean Koontz-style horror novel. The Visionist, by Rachel Urquhart: My mom was the one who recommended this book about a Shaker community in 1840s Massachusetts. First, a disclaimer: I don’t always like historical fiction because I find it can be a bit dry, a bit draggy, or a bit too infused with modern sensibilities (which is why I love Hilary Mantel’s Wolf Hall series so much, because it avoids all of these pitfalls). The Visionist, like much other historical fiction I’ve read, was a bit draggy at times. However, the book’s detailed portrait of life inside a Shaker community kept me engaged. I knew next to nothing about the Shakers before reading this novel, but now I feel like I know what it would have been like to live among them. The titular “visionist” is a teenage girl, Polly Kimball, who is sent to live among the Shakers after she leaves her abusive father to die in a house fire. Her mother wants Polly and her brother to have a better life than she can provide, and so she leaves them at the City of Hope, a Shaker community headed by the severe Elder Agnes. When Polly gets carried away during a worship meeting, the Shakers assume she is receiving divine visions and elevate her to the position of “visionist.” The ensuing tension that unfolds between Polly, a suspicious Elder Agnes, and Sister Charity, Polly’s trusting friend within the community, feels both sad and inevitable. 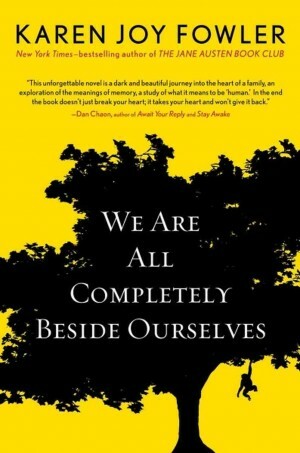 We Are All Completely Beside Ourselves, by Karen Joy Fowler. The less I say about this brilliant, funny, and touching book, the better, because it’s quite easy to spoil. Please do yourself a favor and just read it. Now. You’re welcome. Sleeping Murder, by Agatha Christie. As I may have mentioned, I’m writing a mystery novel. To get my brain in fighting shape for the task, I’ve been reading a lot of mysteries. In terms of expertly crafted, tightly written, clever sleuth novels, no one beats Agatha Christie. Reading her novels is a great object lesson in What To Do while writing a mystery. The woman was a genius! I’ve enjoyed every Christie book I’ve read, and Sleeping Murder is no exception. This was the first Miss Marple mystery I read and I will be reading more; the character is a delight (and she knits!). 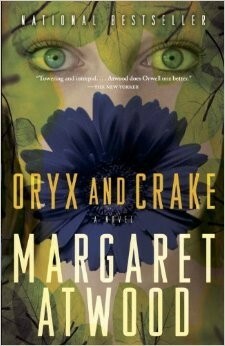 Oryx and Crake, by Margaret Atwood. Speaking of geniuses, Margaret Atwood is one of the most inventive authors of our time, especially when it comes to imagining post-apocalyptic hellscapes wrought by human arrogance and foolishness. Oryx and Crake imagines a world in the not-too distant future in which humankind has been effectively wiped out by a human-manufactured disease. The world before the disease was dominated by Monsanto-like corporations that cranked out horrific animal hybrids and mutations such as Chickie-Nobs: headless, brainless, motionless chickens harvested in labs for their meat. Atwood’s dire vision of our potential future is gloomy, to put it mildly, and can feel heavy-handed at times, but it’s also fascinating, and so well written that I kept turning pages, even as I was horrified by what I was reading. Even more incentive to read Oryx and Crake: it’s part of a trilogy of novels that’s being turned into an HBO series! What are you reading these days? Any recommendations? I’ve just started Neil Gaiman’s Stardust (and am loving it so far) and next in the hopper is Christina Garcia’s King of Cuba. Happy reading! This entry was posted in Books and tagged Agatha Christie, books, Christa Parravani, Christina Garcia, Harbor, Her, John Ajvide Lindqvist, Karen Joy Fowler, mystery, Neil Gaiman, novel, Rachel Urquhart, Sleeping Murder, Stardust, The King of Cuba, The Visionist, We Are All Completely Beside Ourselves on June 10, 2014 by Stephanie.